How to incorporate failure prevention, kaizen training, value stream mapping training and other enterprise development tool into your SOP writing. How to incorporate failure prevention, kaizen training, value stream mapping training and other enterprise development tools into your SOP development. 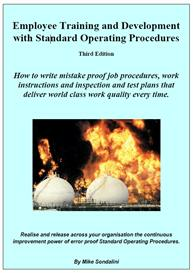 With this Standard Operating Procedures example you can develop a world class manufacturing SOP template. This second edition has a new development to encourage the rapid creation of high skills and abilities through enterprise development. It is called the 3T failure prevention method 3T stands for Target, Tolerance and Test. You will learn how to use 3T failure prevention during SOP development so that work quality skyrockets as people quickly become highly skilled. Another new method used in this second edition is a revised way to layout SOPs horizontally for Value Stream Mapping to continuous improvement model for job performance by identifying wasted time and resources. The last major inclusion in this edition is to present the simplest enterprise quality performance improvement program known. The 'Accuracy Controlled Enterprise', or ACE, represents an ideal to strive for in running organizations. 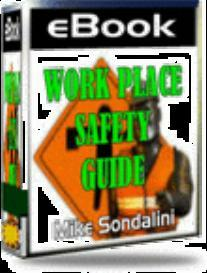 Much simpler than establishing a quality management system like the ISO9000 series, or introducing Lean or Six Sigma. An ACE uses 3T failure prevention methodology as an enterprise development tool. In reality SOPs should be written to save organizations time, money, people and effort because, used properly, they will maximize productivity and deliver outstandingly reliable performance every time. Remember, a business that does not purse excellence in all activities will not last those that do always prosper. to deliver world-class quality and performance. Realize and release across your organization the continuous improvement power of Standard Operating Procedures. 4. The Accuracy Controlled Enterprise Concept What it means to be an ACE.